Background: Metastatic melanoma to the mucosa of the upper aerodigestive tract is extremely rare, accounting for <0.6% of known metastasis to the head and neck region. 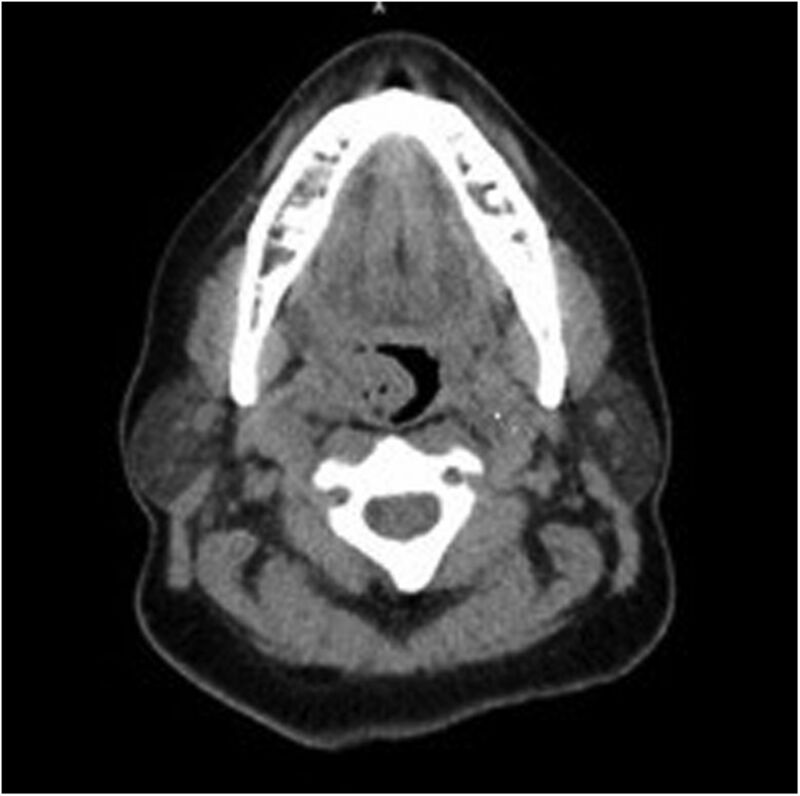 We present a case of delayed metastatic melanoma to the pharyngeal tonsil. Case Report: A 57-year-old African American female presented for evaluation of a rapidly enlarging unilateral tonsil mass. Three years prior to presentation, she had undergone primary resection of and systemic therapy for cutaneous melanoma on the sole of her right foot. 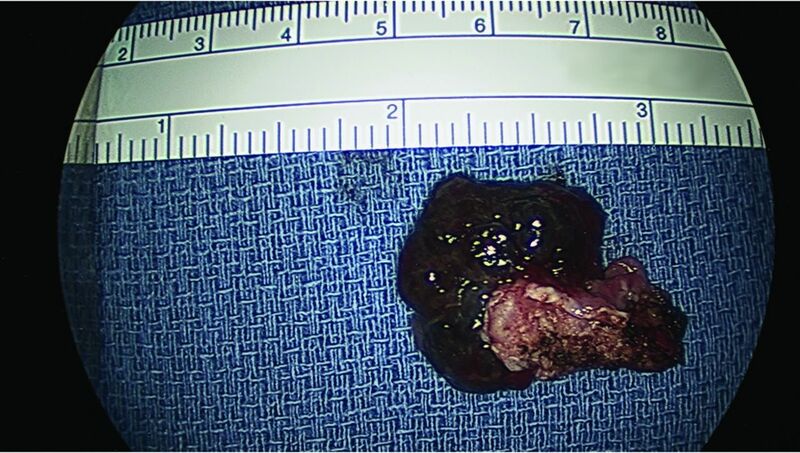 Tonsillectomy confirmed the diagnosis of metastatic melanoma. Because of the poor prognosis of the disease, the patient was referred for palliative chemotherapy but died shortly after beginning treatment. Conclusion: Metastatic melanoma is a rare disease in African Americans, and the presence of metastatic lesions is a significant prognostic indicator for long-term patient survival. Meticulous head and neck examinations should be performed during the follow-up period, and any pigmented lesion should have a high suspicion for metastasis in any patient with a history of cutaneous melanoma. In the United States, cutaneous malignancy is the most common cancer, and an estimated 9,500 people are diagnosed daily.1 The Survival Epidemiology End Results (SEER) database reported more than 76,000 new cases of cutaneous melanoma in 2016 in the United States, with melanoma deaths accounting for 70%-75% of deaths from skin cancer and 1.7% of all cancer deaths.2 The high mortality rate associated with melanoma is attributed primarily to its high local and distant metastatic rate. Distant metastasis is most commonly found in the lungs, liver, and brain, but metastatic melanoma has been found in uncommon places. The palatine tonsil is a component of Waldeyer’s ring that provides a primary rudimentary defense against foreign pathogens. The tonsillar capsule is penetrated with a complex venous and lymphatic network; however, the germinal centers of the palatine tonsil have few lymphatic vessels. Hence, metastasis to the palatine tonsil is considered hematogenous and is likely widespread to other visceral structures at the time of the tonsillar manifestation.3 This type of metastasis is extremely rare, comprising only 0.8% of all tonsillar malignancies.4 Fewer than 30 cases of metastatic malignancy to the palatine tonsil have a cutaneous melanoma origin, and the average occurrence is 6 years after the primary cutaneous melanoma removal.3,5 We report a rare case of tonsillar metastasis 3 years after melanoma diagnosis. A 57-year-old African American female presented to the otolaryngology clinic for evaluation of a painless, rapidly growing right tonsil mass. Three years prior, she had undergone a wide local excision of a cutaneous melanoma on the sole of her right foot. Her initial pathology was unavailable because she was treated at another hospital. She underwent systemic treatment with interferon and had been disease free until her presentation. She reported that her tonsil mass appeared after she attempted to express a tonsil stone. She was concerned that she had caused local trauma to the area that formed a hematoma. Her physical examination was significant for a large pigmented exophytic lesion of the right tonsil. The remainder of her examination was unremarkable, with no evidence of pathologic nodes in her neck. Computed tomography (Figure 1) without intravenous contrast revealed a right tonsil mass with no evidence of local tissue invasion or enlarged nodes. Because of the high suspicion of metastatic melanoma, the patient underwent tonsillectomy with panendoscopy (Figure 2). No other concerning lesions were noted on direct visualization, and the tonsillectomy was performed without complication. The tonsil demonstrated minimal normal-appearing tonsil tissue that had been replaced by pigmented tissue (Figure 3). Pathology revealed large pigmented cells with enlarged nuclei and prominent nucleoli, staining positively for S100, tyrosinase, and MART-1, consistent with malignant melanoma. To differentiate primary mucosal melanoma from melanoma metastasis to palatine tonsils, the histopathology must be carefully studied. Primary mucosal melanoma is identified with the presence of junctional activity of either overlying or adjacent mucosa, while metastatic melanoma lacks both.6 Because of the patient’s previous cutaneous melanoma and the lack of junctional activity on the histopathology, her tonsillar lesion was most consistent with metastatic melanoma. Figure 1. Non-contrast computed tomography scan in the axial plane shows the exophytic tonsillar mass without evidence of local invasion. Figure 2. 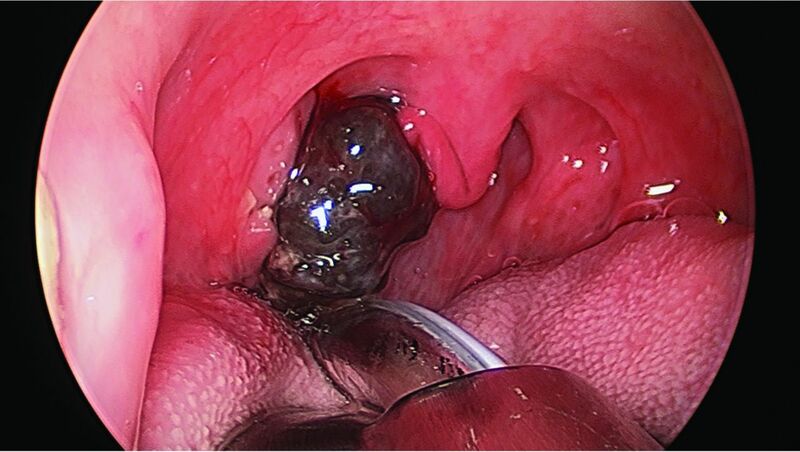 Intraoperative photo demonstrates the large pigmented exophytic lesion of the right tonsil. Figure 3. Gross evaluation of the right tonsil revealed a 3-cm exophytic pigmented lesion that had replaced grossly normal tonsil lymphoid tissue. Postoperative positron emission tomography (PET) showed FDG-avid lesions in the patient’s lungs, abdomen, femur, and lumbar spine. Because of the diffuse metastatic nature of her disease, the patient was referred for palliative chemotherapy, but she died shortly after starting treatment. While metastasis to palatine tonsils is extremely rare, other primary tumors besides melanoma have been reported, including lung, breast, colon, gastric, renal, and prostate cancers. Bilateral tonsillar metastasis has also been reported.12 Imaging studies such as PET and magnetic resonance imaging are used in stage III and IV melanoma to detect metastasis. However, PET scans have been shown to miss metastasis to a region with high physiological metabolic activity such as tonsils.13 Consequently, any suspicious lesion of melanoma should be biopsied even if the PET scan is negative. Similarly, follow-up visits should be thorough and include an oral mucosa examination. Previous cases of patients treated for melanoma had tonsillar manifestation between 4 and 84 months; therefore, surveillance should not be neglected at later visits.3,14 Even though no treatment modality for tonsillar metastasis from melanoma has been proven to be effective, a combination of tonsillectomy and immunotherapy prolonged a patient’s survival to 52 months after the initial metastatic presentation.11,15 Once metastatic melanoma is found on the palatine tonsil, the condition is assumed to have disseminated to other viscera; hence, patients and family should be introduced to hospice and palliative care early. Our case represents a rare manifestation of tonsillar metastasis in an African America female years after an initial diagnosis of primary melanoma cancer. We hypothesize that ours may be the first such case seen in an African American patient as the incidence of melanoma is inherently low in this population. Despite the low incidence of melanoma in African Americans, physicians should be reminded that a diagnosis of melanoma in this population contributes to a poor prognosis. Clinicians should be aware of this entity, and a comprehensive examination including thorough oropharyngeal inspection is strongly recommended at every visit. American Academy of Dermatology. Skin cancer. https://www.aad.org/media/stats/conditions/skin-cancer. Accessed February 28, 2018. National Cancer Institute. Surveillance, Epidemiology, and End Results Program Cancer Stat Facts: Melanoma of the Skin. http://seer.cancer.gov/statfacts/html/melan.html. Accessed February 28, 2018.
, Pavesi M, Calamandrei P, Rapicano V, De Gaudio C. Tonsil metastasis from cutaneous melanoma: first clinical sign of recurrence after complete lymph node dissection. J Cutan Med Surg. 2010 Jan-Feb;14(1):43-45.
, Callihan MD, Corio RL, Hyams VJ, Karnei RF. Oral pathology. Otolaryngol Clin North Am. 1979 Feb;12(1):29-43.
, Móz LE, Weber SA, Martins MG, Martins RH. Tonsilar metastases of melanoma in an older person. Age Ageing. 2013 Jul;42(4):545-546. doi: 10.1093/ageing/aft035. , From L, Bernardino EA, Mihm MC. The histogenesis and biologic behavior of primary human malignant melanomas of the skin. Cancer Res. 1969 Mar;29(3):705-727.
, Sidhu K, Lau CS, McRoy GJ, Chamberlain RS, Smith FO. Malignant melanoma in African-Americans: a population-based clinical outcomes study involving 1106 African-American patients from the Surveillance, Epidemiology, and End Result (SEER) database (1988-2011). Medicine (Baltimore). 2017 Apr;96(15):e6258. doi: 10.1097/MD.0000000000006258. , Wu XC, Jemal A, Martin HJ, Roche LM, Chen VW. Incidence of noncutaneous melanomas in the U.S. Cancer. 2005 Mar 1;103(5):1000-1007.
, Torres SM. A new understanding in the epidemiology of melanoma. Expert Rev Anticancer Ther. 2010 Nov;10(11):1811-1823. doi: 10.1586/era.10.170. , Robbins KT, Weitzner S. Upper aerodigestive tract metastases in disseminated malignant melanoma. Arch Otolaryngol Head Neck Surg. 1986 Jun;112(6):659-663.
, Myers JN, Myers EN, Kirkwood J. Malignant melanoma metastatic to the tonsil. Laryngoscope. 1996 Mar;106(3 Pt 1):313-316.
, Jaques WE, LaMonte SE, Zollinger WK. Hypernephroma metastatic to the palatine tonsils. Ann Otol Rhinol Laryngol. 1979 Mar-Apr;88(2 Pt 1):235-240.
, Usta U, Sezer A, , et al. Synchronous tonsil, gallbladder, and cardiac metastases without any other visceral metastases of malignant melanoma. Onkologie. 2009 Apr;32(4):197-199. doi: 10.1159/000201126. , Kageshita T, Ono T. Metastatic melanoma to the palatine tonsil with a favourable prognosis. Br J Dermatol. 2001 Aug;145(2):327-329.
, Padhya TA. Metastatic melanoma to the upper aerodigestive tract: a systematic review of the literature. Laryngoscope. 2014 May;124(5):1143-1149. doi: 10.1002/lary.24436.